It was the Spring of 1999 and I was taking a break at work. I was planning a trip to Sedona Arizona. Additionally, I had just consolidated all outstanding college-related debt including canceling of all credit cards and was feeling ‘free’ – ready to redefine the trajectory of my somewhat mundane life. I was about to click ‘purchase’ when one of the executives requested a brief discussion in her office. Three months, and much ‘how-are-you-providing-unique-value-to-our-country’ paperwork later, I was ready to relocate to our office in Sydney Australia. My new ‘Go-to’, or manager, would be Gale. I knew him a little bit but recall knowing that he was highly regarded and would be my main advisor in this consulting role in Gallup’s most recent acquisition. I would also have reporting responsibility to the country manager and regional leader. The most important thing I would learn in the first few months was who to go to for what. A true matrix. After reminding my mother that my current life was more on hold than her perception of what this might be, Gale and I met in SFO to take me to a new city. We flew business class. Using his many millions of miles. He chuckled apologetically as we took off, noting that this would likely be my last company-sponsored business class ticket. It was also my first. I remember little about the details of our working 15+-hour journey from California. I recall more reflection and consideration, more about getting to know myself, the new consultant in a city center new to the company but not new to the current employees or customers. I wish I could find those notes or recall more details of his thoughts and how they helped me to know myself or realize I should. This was pre-virtual work environments. But not pre-globalization. Gale was globalization. He built this sort of relationship with consultants and researchers on all continents. While we would meet in person only two times per year, Gale was always an email or a phone call away, no matter the time of day in Lincoln. I so looked forward to those breakfast meetings during my US visits; the opportunity to get input on my laundry list of hugely important items. When it was time to acknowledge my expat duties were complete and return to the states, he said “Steph, I would like to give you a choice but we really need you in Seattle. Are you ok with Seattle?” Of course I was ok with Seattle, I trusted the who. While I would end up with a different city and a choice about that, I would always know from his human-first approach, that he was juggling the interests and talents of his humans, in cities all over the world, in balance of company strategy. As the best example of mentoring leadership and humanity in business, I now reconcile all that Gale taught me and so many other consultants. Almost all of it was as an example to us, not as a manager of us. During the most stressful days of my career, I would be trusted. To navigate, to ask, to defer, to observe, to push, to fail, to learn, and to expect. I attribute so many key lessons in leadership to working with Gale. Trust. Patience. Perspective. Discernment. Candor. Humor – even in the most serious of situations. 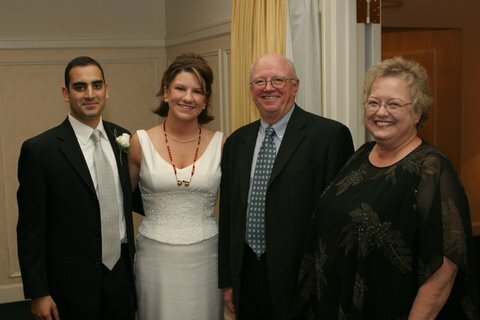 Gale and Kay Muller at our wedding, November 2005. In the most fundamental way, he also was my best teacher about the value a consultant provides to customers. Whether they be internal or external. He simply outlined his view of time and how we help customers according to insight and issues, always through a team. As we celebrate his life and the peace that his suffering on earth is over, I wonder if he knew how much who he was helped so many become who they are. I hope to some degree he did. I feel so thankful for having such an incredible manager, mentor and friend during such significant milestones in my career. To him I imagine his guidance was meaningful but also part of his day-to-day normal way of interacting with others. It was who he was.